Skyway Cafe is going to be 100 years old! Come get your memorabilia and eat a great meal! While going out to breakfast is a typical weekend activity, the Skyway Cafe, 6105 E. Rutter Ave., offers customers a little bit of local history to go with their meal. Part of Felts Field Airport, the Skyway Cafe has been renovated in the past few years to reflect the history of the airport, which will celebrate its centennial in 2013. An art deco concrete clock stands outside the building, a memorial to Lt. Nick Mamer, a pilot who flew in World War I and founded the Northwest Transcontinental Airway. A weather vane – a 19-foot cassette racer airplane – sways in the breeze. It’s a real plane, built and owned by Bob Heale, a local pilot who once saved the life of ABC-TV reporter Ted Koppel during the Vietnam War. Heale died in 1996 and the weather vane stands as a memorial to him. While looking at these monuments, the smell of bacon draws you into the cafe. Sandra Melter bought the Skyway Cafe from her sister, Teresa Maxfield, in 2006. Melter was once a surveyor. While on the job, she fell off a cliff. As she recovered, she spent time as a cook in her sister’s diner. The cafe didn’t always have its aviation theme. 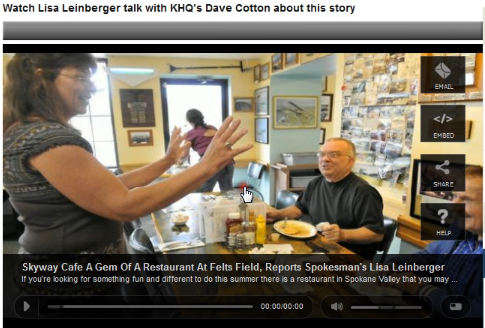 It was just a regular diner, but Melter said it had a great advantage. “It’s always had great food,” she said. She said the chicken-fried steak is a popular item, along with the cinnamon rolls. She said her food distributors tell her she sells more biscuits and gravy than anyone in Washington. Melter said they have never backed off of the quality of their food, even when the recession hit a few years ago. Along with the food, diners can watch airplanes land and take off. Although there are no commercial airlines at Felts Field anymore, private planes come and go all the time. 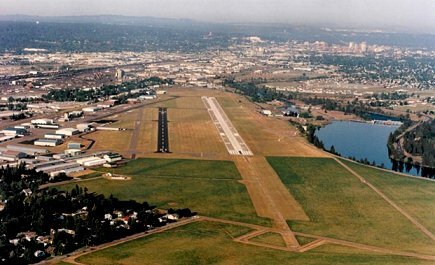 Felts Field was the first airport in Spokane when it opened as Parkwater Field in 1913. In 1927, its name was changed to Felts Field after Lt. James Buell Felts, a Spokane Valley native who was once the publisher of the Spokane Valley Herald and a pilot during WWI. Felts was on a routine training flight from Parkwater when his engine stalled. The plane fell from the sky, killing Felts and his passenger. Felts Field is very close to Fancher Way, a street named for another Spokane pilot. Maj. John T. Fancher was a pilot during WWI and was performing in an illuminated night flight at an air show in Wenatchee in 1928. He was dropping small, grenade-like bombs during the show and several of them were duds. When he landed, he picked up three of the bombs. One exploded in his hand and he died of his injuries the next day. Photos of Felts and Fancher hang on the wall just behind the register in the cafe. Melter has also devoted an alcove to the Ninety-Nines, a women pilots group. Preserving the airport’s history has become as important to Melter as the daily special. She’s restored old photographs and is always on the lookout for others. Part of her collection has been displayed at the Spokane Valley Heritage Museum for its “On a Wing and a Prayer” aviation exhibit. She said part of the dining experience has always been the show going on outside the cafe’s windows. A B-17 lands at the airport every year in June. The rest of the year visitors can see many different planes, such as float planes, jets, helicopters and stunt planes. Often, visitors sit in the grass and watch the planes come and go. “You never know what’s going to land here,” she said.